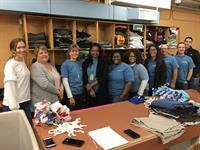 Colonial Life celebrates King’s legacy through volunteerism - Partners - Columbia Chamber of Commerce ? Colonial Life & Accident Insurance Company is a market leader in providing financial protection benefits through the workplace, including disability, life, accident, dental, cancer, critical illness and hospital confinement indemnity insurance. The company’s benefit services and education, innovative enrollment technology and personal service support more than 90,000 businesses and organizations, and 3.8 million of America’s workers and their families. For more information visit www.coloniallife.com or connect with the company on Facebook, Twitter, and LinkedIn. Colonial Life is a registered trademark and marketing brand of Colonial Life & Accident Insurance Company.